At some point, you’ve prototyped all the prototypes and gone from REV1 to REV12. In short, you’ve made your final production prototype. It’s time to start finding out how much it will cost you to get it made. Since this is a “Big vs. Small” article, we’re going to look at this from the low volume manufacturing perspective, meaning a production run of less than 500. 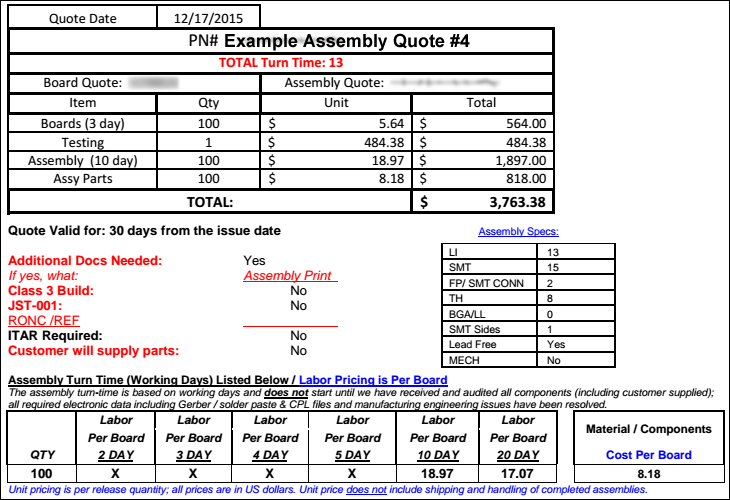 There are some general costs visible in every Contract Manufacturer (CM) quote; however, some will be hidden. 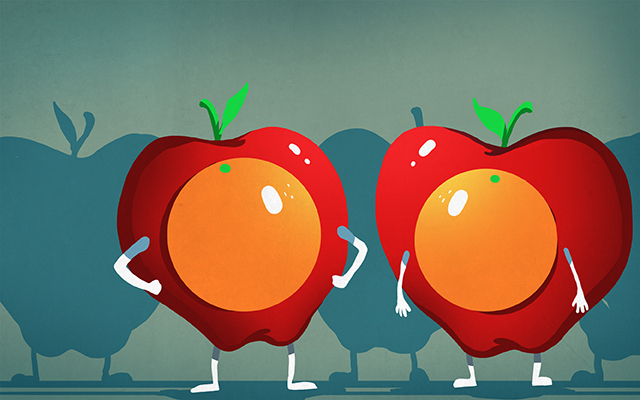 In order to evaluate one CM vs. another, comparison needs to happen at the line item level. How those costs are presented will also vary from CM to CM, so pulling a quote apart can be very tricky indeed. If the CM is sourcing all the parts, then this should contain a broken out view of all costs necessary to procure and prepare the components for assembly. You’ll also see that this cost is probably higher than if you purchased the parts yourself. 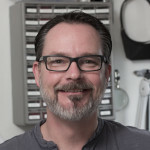 Think of it as a concierge service: they’re assuming all the hassle of sourcing the parts, getting them shipped, tracking the packages and sorting out what is received. If you’ve ever done this yourself for a BOM over three or four items long, you’ll know that there is an added cost for “hassle factor”. We’re really discussing a “turnkey” quote here, meaning you send the CM the design files and they send you back an assembled product. Sourcing and kitting the parts yourself will lower costs, but up your personal “hassle factor”. Most likely, your CM will still charge a handling fee, but it will be less than the cost of having them source it all for you. In most cases, you don’t need to furnish a panelized design. They’ll have a specific panel size that works best for their assembly equipment so sending a single board file should suffice. However, panelization can save you some of the costs, specifically because of the cost difference between PCB fabricators. 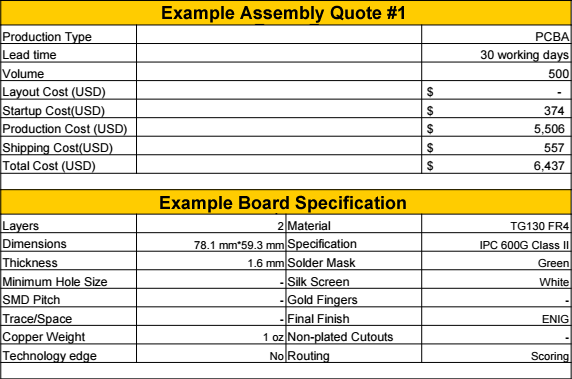 If you can panelize the design yourself, to the specification of the CM, you may be able to work with a PCB Fab of your own choosing to get a significant discount on that cost. Be careful though, because some CMs will not accept panels that they didn’t generate themselves. Intuition holds that the longer your BOM is, the more the finished product will cost. 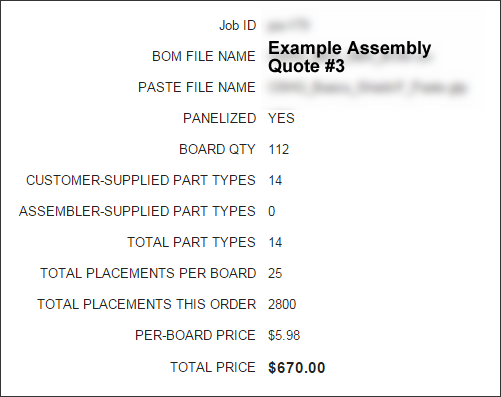 Think of your BOM in two ways, both the sheer number of individual parts that are on the board, and the different *types* of parts that are on the board. If either of those numbers are high, that inflates the assembly cost. Keeping all your parts on one side of the board will help to keep the assembly cost down. Surface mount (SMD) components will be less expensive on small volume runs than through-hole parts (PTH), unless your entire board is assembled using PTH (insert joke about 1976 calling for their electronics back). Pin pitch of the components on board will have an effect on the assembly cost as well, because smaller pitch parts require greater accuracy from the placement equipment. Ah, the dreaded NRC. 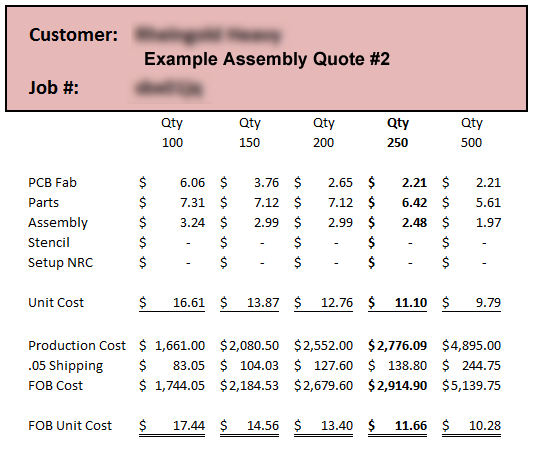 These are “setup costs” or flat, fixed costs that exist at the beginning of your production run. You pay regardless of the quantity. Consider it the cost simply to begin production; the more boards you produce, the less the NRC affects the per-unit-cost. Every quote will have one, some will be more reasonable than others. The thing is, there are some aspects of assembly that can’t be quantified in any other way, so it gets lumped into the NRC. How much solder paste are they using on your board? How many fidgety, teeny pin pitch components do you have? How many reels will they need to load on their Pick-n-place? Do they have to panelize your board for you? How difficult of a job is it to quote at all? There are many things that have a flat fee assigned to them and then tossed into the NRC. Sometimes a CM will ask to be reimbursed specifically for the stencil, sometimes they won’t. With all the various costs included, it still all boils down to this: steel vs. kapton. Kapton stencils are very inexpensive, but not durable. For a low volume production run, you can probably get two or three stencils made and as one wears out, you just switch to the next one. However, if you’re planning on doing a small run many times over (say batches of 100 to ship to a distributor quarterly), then it might make sense to opt for steel. While there is significant cost associated with steel, their durability makes it worthwhile. The decision may not revolve around the volume though, but around pin pitch. Even for five boards soldered at home, if the pin pitch of your components is super small (sub 1mm), the kapton won’t cut it. The webbing between the pads will immediately start to deform at best, and tear at worst. This causes multiple bridges under the hardest component to troubleshoot and clean up. CMs should inform you on whether your design requires a stainless steel stencil; this may result in a separate line item. Did your CM quote shipping? Finished product doesn’t just magically appear on your doorstep, after all. Make sure you know exactly how much it’s going to cost you to have those boards dropped off, before you sign a contract. As in every industry, the cost of shipping is an easy place to hide extra money — think of every notorious super cheap eBay deal that had a correspondingly outrageous shipping cost. Obviously if you need a quick turn on your boards (2-3 days), the cost of shipping will start to balloon. Then again, so will every other aspect of your production cost, so that’s to be expected. On 20-30 day turn with standard ground shipping, shipping costs should be related to distance from their branch (nothing more). If your Kansas City based CM wants to charge you $85 for shipping, but your Houston based CM wants to charge you $535, you should be wary and ask questions. All of the example quotes above are actual quotes from contact manufacturers obtained over the past year. I’ve only hidden the job names and the names of the CMs, as they aren’t really relevant. The point is, there is no unified way that the cost of assembly will be presented to you. Everyone uses different language, different quote engines and presents the costs in a different way. Your best bet, is to create a spreadsheet with terms you understand, and then lay the costs from each quote. Once you’ve broken down exactly which piece is being quoted, you can compare the costs directly . I also highly recommend breaking those costs out both for the contract as a whole, and on a “per unit” costs, meaning the cost per board. Picking a manufacturer can have a huge impact on the success or failure of your product. Properly shopping designs around to multiple CMs and comparing quotes is definitely time well spent. What are some tips and tricks you’ve had for finding a Contract Manufacturer? Let us know in the comments below!